Don’t miss these fun events over Labor Day weekend! We can’t ever resist a good beer, wine, or other tasting—especially a bourbon tasting. 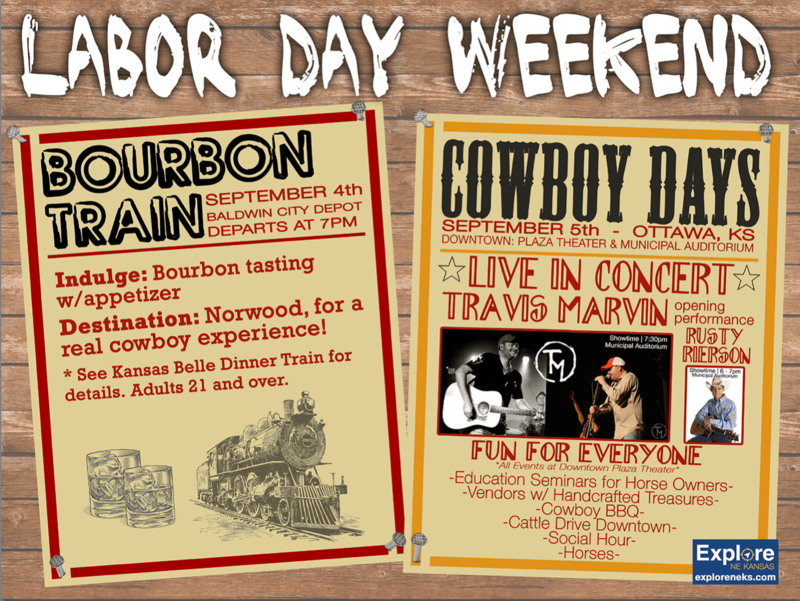 On September 4, board the Kansas Belle Dinner Train bound for Norwood and enjoy a bourbon tasting, appetizers and a real cowboy experience. The train departs from the Baldwin City Depot at 7 p.m.; guests must be at least 21, of course. The cost is $75 per person—call 785.594.8505 to make your reservation. Then the next day, on Saturday, head over to Ottawa for the Cowboy Days celebration at the Plaza Theater and Municipal Auditorium. This has something for everyone: educational seminars, shopping, food, horses and more—including a cattle drive downtown! Local favorite Travis Marvin will also perform a live concert, with an opening performance by Rusty Pierson. And, food and drink will be catered by Sandbar Subs! Spend your Labor Day weekend doing something unique!